A V-neck cardigan with curved hem at front and lace detail at the back neck. It’s knitted from top down seamlessly in one piece. 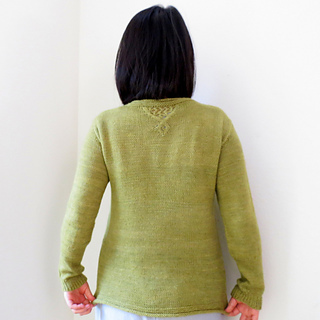 Set-in sleeves are knitted top down with stitches picked up from armhole. sizes are based on chest measurements of finished garment in inches. Sample shown with 2 ½” / 6.5 cm positive ease. 1 to 3” / 2.5 to 7.5 cm positive ease is recommend. Sample used The Fibre Company Road to China Light: 65% Alpaca, 15% Silk, 10% Camel, 10% Cashmere, 159 yards / 145 meters per 50g skein, color Peridot. Needles US #4 / 3.5 mm, or change needles to obtain gauge. Gauge 22 sts x 30 rows = 4” x 4” / 10 cm x 10 cm in Stockinette Stitch after blocking.